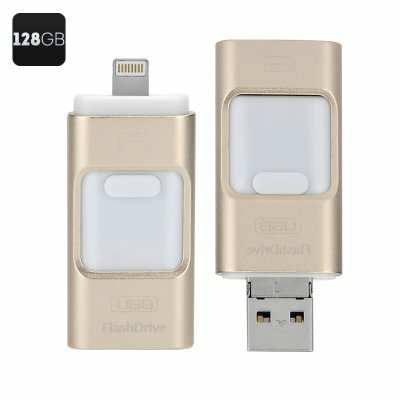 Successfully Added 128GB Multi-functional USB FlashDrive - High Speed USB 2.0, Triple iOS, Android, Windows Interface to your Shopping Cart. The Ultimate storage expansion solution for mobile devices supports iOS, Windows and Android. Quick and easy data backup, transfer and storage on your mobile devices means you'll never run out of space again. Secure encrypted 128GB of flash storage so you can back up contacts, save photos and transfer files between you OTG supported devices with high speed USB 2.0 read and write speeds. Helping you effectively manage and keep safe your private data. Suitable for use on cell phones and tablets PC supporting OTG, such as Samsung Galaxy Note, iPad, iPhones and other windows, iOS or Android devices. This 128GB Flash Drive comes with a 12 months warranty, brought to you by the leader in electronic devices as well as wholesale electronic gadgets and accessories..